Beauty all around. 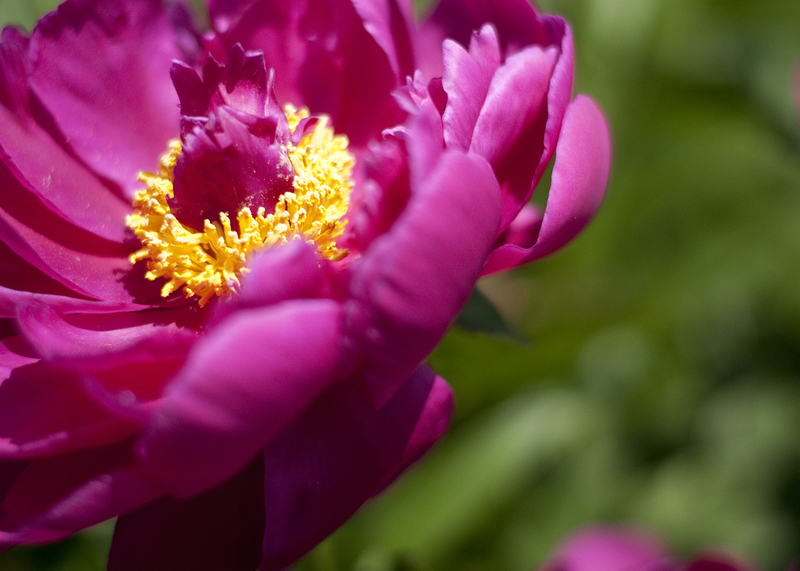 A peony in our yard. I’ve come to a conclusion. If you’re too busy to spend time with people you love, you’re a loser. I don’t mean “loser” as a devaluing label. I mean you are losing some very, very important things. Today’s memories are built today. You can’t erase them and you can’t go back and change them or invent them later. I might be somewhat melancholy right now. My little girl is getting married next weekend. I still see her standing on the pitcher’s mound at a tee-ball game wearing purple shorts, orange t-shirt, shiny new cleats and a batter’s helmet to protect her noggin’ if another 6 year old hit the ball hard enough to reach her. I still see her climbing snow banks and riding her bike. Just yesterday she was dressed up like her American Girl doll. I hear her laughing and calling herself “Zeewah Bob” when I called asking for her from my office. My little girl. How thankful I am to have a bank account of memories with her going on “daddy dates” and growing into a beauty. My wife and I went out to watch the sunset the other night. We marvelled at the oranges, the pinks and purples while sitting silently on a dock. 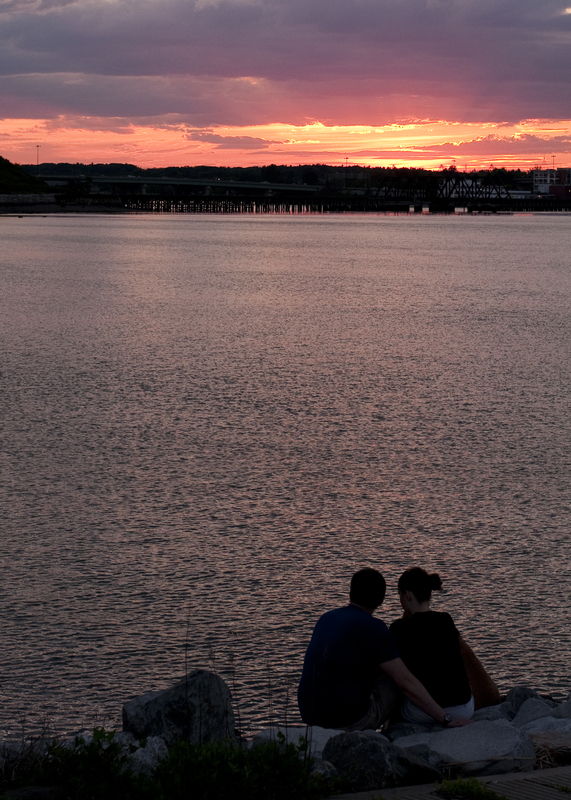 I snapped this picture of young lovers huddled up in the cold, watching the sun sink. I smiled. My Robin has been by my side for 29 years. These two weren’t even born when we began our lives together. How thankful I am for memories with my sweetie. If you are too busy to date your wife, spend time with your husband, you’re a loser. You are losing moments you can never get back. This liver disease that I now live with makes me so very thankful that I have a bank account of memories. Christmas Eves at my parents’ house, Hook pinball with my Josh, feeding squirells with my Jake. I got to perform my neice’s wedding ceremony. I wrestled with my nephew Jamie who I taught to say he was “homely” by convincing him it meant handsome. I remember video taping with Jason and holding my baby neice Rebekah. Skyping with my sisters and laughing with Pajama Lou. Yearly vacations, holidays, trekking with our BFF’s, The Simpsons (“Is it bear wear?”). My balance of treasured memories is overflowing. So many friends in my youth groups with weddings, baptisms, lock-ins, mission trips and retreats … they’ve blessed me so much. Lovers of people are not losers. I pray that I’ll continue to get stronger and that the need for a liver transplant will stay off in the future. And yes, I even pray for the impossible that I will be completely healed. But most of all, I pray that I will represent my Jesus well and have the opportunity to encourage others to put all the church baggage aside and just look into Jesus Christ, who He claimed to be and how He lived. I’m determined to be a lover and not let this liver make me a loser. Does that make sense? Stop and smell the flowers, walk the beach, take your daughter fishing … you will never regret it. There is beauty all around. Don’t let your challenges make you miss it. I feel good! I had two nights this week with no muscle cramps. With the $10,000 payment due Monday, we are blessed to be halfway there because of gifts given online at http://scottlinscott.chipin.com/ , sent in the mail, handed to us or from buying the greeting cards with a photo I took on the front. Pray that we are able to make the payment somehow. When we do, Florida Hospital will wipe out the remaining $4200 due. The custom greeting cards are here! We have PLENTY still available for sale. If you would like to put some in your business or offer them to friends, just let me know at cards@linscottphoto.com . Because I was able to order 1,000 every box sold puts up to $23.75 in our fund. Thanks to all who preordered! You can still order online at this page. Or come by the house to save postage. Doctor’s appointments. Physical today. Appointment with my liver doctor was changed. They are going to call to reschedule. I am still losing weight, which is not good, I am now at 220. They want me to maintain my weight but my appetite just isn’t there. My businesses are slowly building. I have a few portrait sessions coming up and another meeting about a wedding on Saturday. My web design work has a couple businesses who have expressed interest but have not pulled the trigger yet. Pray for new clients. PRAY FOR OUR HOUSE TO SELL! This entry was posted in change, Christianity, Christmas, chronic illness, Country music, discouragement, facing death, Fatty liver, Fatty Liver Disease, Find God, hope, Jesus, Lahey Clinic, Liver disease, NASH, organ donation, Organ transplant, peace, time management, transplant and tagged bear with one another, chronic illness, cirrhosis, direction, faith, family, fear, fishing, help, Liver disease, memories, NASH, organ donation, transplant. Bookmark the permalink. You made me and Elizabeth cry! thank you Scoo, I love you. Every wake up and smell the roses.